Donald Trump recently lavished praise on Larry Fink for growing the president's fortune. But the BlackRock boss isn't exactly returning the compliment. Fink warned on Wednesday he sees "a lot of dark shadows" that could rattle global markets in the coming months. That's quite a warning, coming from the CEO of the world's largest money manager BlackRock (BLK), which controls more than $5 trillion in assets. Fink joins a growing list of corporate leaders and Wall Street analysts to raise concerns about the timing of Trump's agenda and the markets' overly-optimistic expectations for it. This week, Irene Rosenfeld, the CEO of Oreo maker Mondelez (MDLZ) expressed worry about "significant disruption and uncertainty" from the "backlash against globalization," and Goldman Sachs warned about the potential negative effects of restrictions on trade and immigration. Speaking at the Yahoo Finance All Markets Summit, Fink also specifically cited the "breakdown of globalization" signaled by Brexit and Trump's election. Fink is concerned about businesses putting major decisions on hold as they seek more clarity on the timing and details of Trump's plan to stimulate the American economy through tax cuts, infrastructure spending and regulation-busting. "Most business people are not investing today. They're waiting to see what may happen. I believe we're in the midst of a slowdown as we speak because of all the uncertainty," Fink said. Fink has supported Democrats and donated money to Hillary Clinton in the 2016 presidential race. The BlackRock boss was even mentioned as a leading contender to be treasury secretary if Clinton had defeated Trump in November. Still, Fink was named to Trump's all-star team of CEOs and the president praised him at the group's first meeting at the White House last week. "Larry did a great job for me. He managed a lot of my money. I have to tell you, he got me great returns," Trump said. Fink's words of caution come as U.S. markets are sitting near all-time highs. 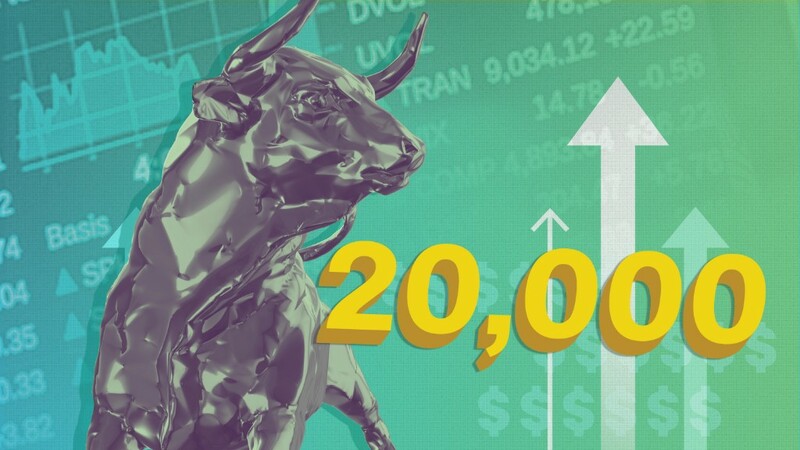 The Dow has surged more than 1,700 points since Trump's election and recently crossed the 20,000 milestone for the first time ever. But markets have priced in little risk of a setback. The S&P 500 has gone 81 days without a 1% selloff, the longest period without a big drop since 2006. "I think markets are ahead of themselves," Fink warned. While Trump has slammed trade deals for shipping jobs overseas, the BlackRock CEO forcefully defended globalization, saying, "I believe the world is better...because of global trade." Fink admitted that some people are being "left behind," but suggested much of that is driven by the powerful force of "technology transformation." Recent research supports that point that Americans should be more concerned about robots than Mexico. One study by professors at Ball State University found that between 2000 and 2010 about 87% of the manufacturing job losses were caused by factories becoming more efficient through automation and better technology. Just 13% of the lost jobs were because of trade. Fink warned that a breakdown in global trade and globalization -- Trump has pulled out of the Trans-Pacific Partnership and wants to renegotiate NAFTA -- is deflationary. That's why Fink said there's a good chance the 10-year Treasury rate could plunge back below 2%. The closely-watched rate is currently sitting at 2.35%. Yet Fink hedged a bit, explaining he could also make a case for the 10-year Treasury yield continuing its post-election climb to 4%, especially given the low unemployment rate and promises for more stimulus. "Obviously you're hearing from me that I'm pretty confused. We're living in a bipolar world right now," Fink said. Asked for the last time he felt like he was living in a "bipolar" world, Fink responded: 2008. Andy Serwer, Yahoo Finance's editor-in-chief, joked that the comparison isn't all that comforting. "I'm not relaxed. Sorry," Fink said.